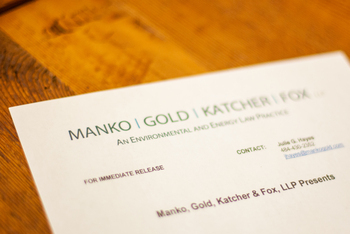 The environmental, energy, litigation, safety and land use law firm of Manko, Gold, Katcher & Fox, LLP (“MGKF”) located in Cherry Hill, NJ and just outside Philadelphia, PA, will serve as a co-sponsor of the Chamber of Commerce Southern New Jersey’s (CCSNJ’s) “Meet the Policymakers” program featuring the Honorable Stephen M. Sweeney, President of the NJ State Senate, Third Legislative District. He will discuss his legislative accomplishments from 2016 and priorities looking ahead to 2017. Breakfast and networking will start at 8:00 am. Programming runs 8:30-9:30 am. See our events page for further information and registrations details.